This is one of our closest galactic neighbors, the Andromeda Galaxy, seen in three different kinds of light: visible, infrared, and x-ray. These three very different views are then combined together to create one amazingly beautiful composite image. This gallery combines images from the European Space Agency's Herschel and XMM-Newton space telescopes, which are able to see the cosmos in wavelengths of light that are otherwise absorbed by Earth's atmosphere, making them impossible to detect down on the surface. 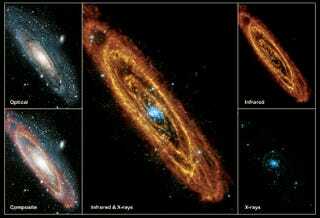 The Herschel telescope is able to pick up infrared light, and its view of the Andromeda Galaxy reveals vast red rings of dust and gas that are slowly coalescing to form new stars. Once the stars emerge, the light they emit becomes, unsurprisingly, optical light we can then see both in space and down on the ground. While infrared is good at looking at the birth of stars, x-rays are great at revealing their deaths, as revealed by the x-ray photo of the XMM-Newton observatory. Stellar debris from exploding stars is one source of x-rays, as are pairs of stars in which one leeches the gas from the other. This process heats up the gas and causes x-ray emissions, and it can leave the original star depleted of all its gas. So, by gathering together three different images, we capture all three phases of a star's existence: birth, life, and death. The composite image that we're left with is the most complete possible view of this faraway galaxy, even if its multiple wavelengths mean it's an image that no one could ever see all at once.